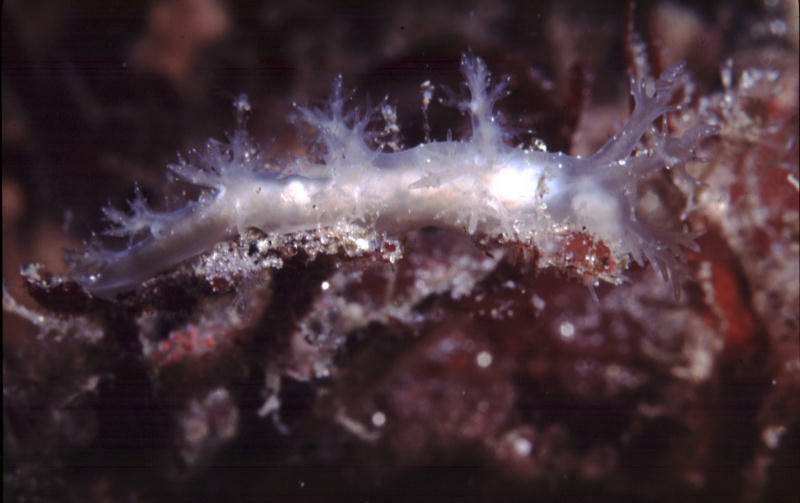 Opisthobranch of the Week is Dendronotus sp. For years now I have been working on a document to update information in my Pacific Coast Nudibranchs . Just when I thought I had compiled the complete list another new critter pops up along the coast here. Steve Gardner has found what looks to be a distinctive new species of Dendronotus. Even though we cannot see all of the important diagnostic features of this genus in Steve's great photo, his critter is different enough in color to draw this conclusion. I am not aware of any Pacific species of Dendronotus that has a translucent body with tiny white specks, randomly distributed over the body. The closest species is Dendronotus albopuntatus , but this species has much more dense spotting and red-brown spots and patches as well. Dendronotus dalli has white lines on the cerata as does D. diversicolor and some specimens of Dendronotus iris . D. diversicolor has a white line down the tail and D. iris has a white line along the edge of the foot. In Pacific Coast Nudibranchs I included an undescribed species with white spots (Dendronotus sp. 1, page 77) that has been observed in southern California, but the background body color of this species is red. Not even close. The one species that Steve's animal could be is Dendronotus frondosus seen at the left, whose color varies greatly and the specific degree of variation is poorly documented. The Sea Slug Forum has a specimen similar in color to Steve's but it is from the Maine coast of the Atlantic. Until someone looks closely at the internal anatomy of this animal we'll have to refer to it as Dendrodoris sp. Thanks Steve. 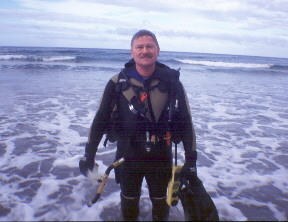 Steve "bumble bee" Gardner as he is known to the regulars at La Jolla Shores was already a veteran diver/photographer when I joined the San Diego Underwater Photographic Society back in 1982. 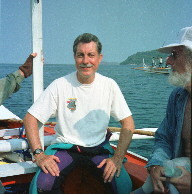 Steve has enjoyed great sucess with the Nikonos system he was using then and still is using now. California diving at times can be quite challenging with cold water and surge. " Washing machine " like water conditions almost make digital photograhy impossible and film photography marginal at best with a housed SLR, can be overcome by using framers! Using framers with a Nikonos was the solution for Steve then and still is the solution under such conditions. So don't despair all you aspiring U/W photographers! When confronted with the high cost of going with a housing either digital or film, you may want to consider looking for a used Nikonos with framers. Pick up an inexpensive strobe to go with it and you're in business at what can be a very reasonable price.